Casual passers-by probably just see a well-established shop that’s been providing the town with bikes for the last 40 years. 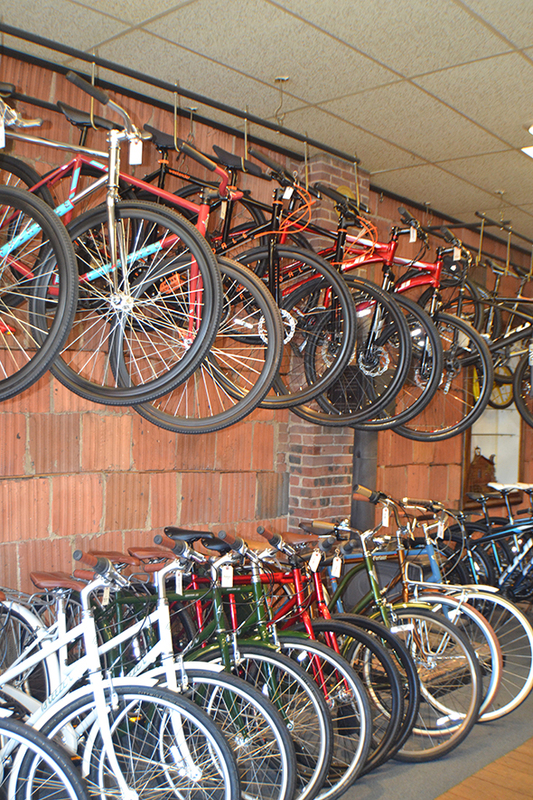 But while the address remains the same at 1318 Main Street, the name has changed from DJais Cycles to Belmar Bike Shop. Ownership changed hands last year after building owner Dirk Rietsma called up former bike shop employee Kyle Rogers, offering him a go at owning the business where he’d worked through most of his teen years. “He said, ‘the place’ll be empty otherwise, and I can’t think of anyone better than you to come in a start a shop, ’” Rogers says. 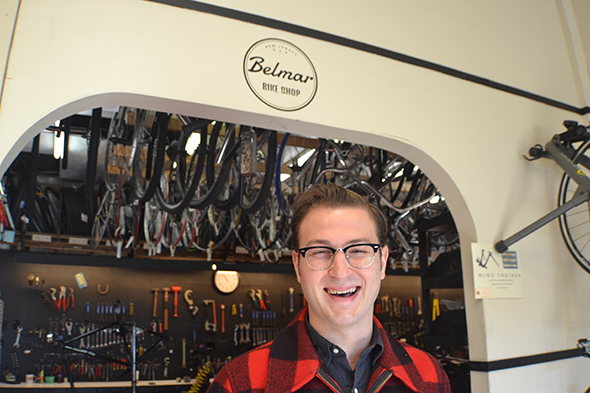 Rogers had worked for Rietsma for about five years while Rietsma ran the shop, but left when the Belmar Bike Shop changed hands. When that owner didn’t renew his lease five years later, Rogers was able to step right in last March. “It’s really cool to have gotten such an opportunity at such a young age. One of the guys is 31 and he’s the oldest, ” Rogers says. Rogers and his staff got to work at once, cleaning up the space and broadening the inventory. And though the previous owner had favored cheap, low-quality beach cruisers, Rogers started introducing whole new kinds of rides, like the slim-wheeled city bikes which are popular in New York, Philly, and other homes of cycling chic. And so the revolution began. “People in the summer with their decked-out crazy beach cruisers, that’s guaranteed business for us. It’s fun, and it’s interesting here in the summer, and that insanity, the demand, fuels the fire for the other stuff of what we do, ” Rogers says. The other stuff of what they do is pretty much everything. As long as it goes on two wheels, anyway. “I got into bikes in general through BMX [bicycle motorcross]. I was sponsored for a minute, competing for a minute when I was young, that’s how I got into bikes. And from there I got into road biking, long distance riding, mountain biking, kind of every facet of riding, ” Rogers says. They’re also tapped into the best part of year-round living in the coastal Monmouth area. People in the region like to support businesses and other people who’re doing bold new things. Especially in a place like Belmar, which has stealthily been getting cooler and cooler while you weren’t paying attention. As they’re coming up on their first full year at the helm, Rogers and the Belmar Bike guys are happy to sit back and let it ride. “I’m waiting to see where the shop takes itself. It’s cool having creative control of everything, and I think the shop can do more than it has in the past. Not just basic bikes, bikes are more than that, ” Rogers says. “It’s kind of a thrill being here, and it’s cool that we’re young guys making a living for ourselves, ” Rogers says. Photo at top is of Kyle Rodgers. This entry was posted on Thursday, February 13th, 2014 at 1:19 pm. It is filed under FEATURE. You can follow any responses to this entry through the RSS 2.0 feed.